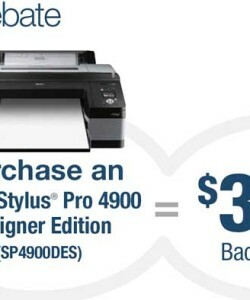 If you are the proud owner of an Epson Printer Stylus Pro 4900 Designer Edition, you qualify for this Epson Printer Coupon whic Mail In Rebate. When you decide to fill out the printable Mail In Rebate Form PDF listed below, you’ll have to follow each of the following 4 steps: STEP 1: MAKE YOUR PURCHASE: Purchase an Epson Stylus Pro 4900 Designer Edition (SP4900DES) between November 1, 2013 and December 31, 2013 and receive $300 U.S. back by mail. STEP 2: ATTACH YOUR RECEIPT AND UPC CODE: Attach a copy of your dated store receipt or invoice with purchase circled and the original or a copy of the UPC code. STEP 3: WRITE YOUR SERIAL NUMBER: Epson Stylus Pro 4900 Designer Edition (SP4900DES) serial number. STEP 4: PLEASE PRINT CLEARLY AND IN CAPITAL LETTERS: and fill out the form. Then, $300 STEP 5: MAIL EVERYTHING TO: Epson Stylus Pro 4900 Designer Edition $300 Rebate P.O. Box 49280 (EA521) Strongsville, OH 44149-0280. Claims must be postmarked within 30 days from the purchase date. Please allow up to 8 weeks for receipt of your rebate. If you do not receive a response by the end of that period, visit www.epson.com/promotions or call the Epson Rebate Response Line at (800) 277-6187 for the status of your rebate. 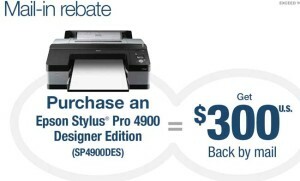 This offer cannot be combined with any other Epson printer rebate. For complete offer details, please read both pages of this rebate form/coupon. Online Rebate Pre-submission. You have the option to submit this rebate form online. Please visit www.epson.com/promotions and click on the link under “Pre-submit Epson mail-in rebates” for details.